You want to hold your baby close wherever you go without breaking your back or the bank. We list the best baby carriers based on comfort, ease of use, and price. When it comes to carrying your precious cargo, the type of baby carrier you choose matters a lot. After all, you want one that will snugly and safely support your baby and be comfortable enough for you to wear, especially as your baby gets bigger. Baby carriers come in all sorts of styles, from the front-strap carriers to the slings or wraps. There are carriers that let you wear your baby on your hip and some that double as a backpack. Many of the carriers give you choices in the way you wear them, while others will give you a headache trying to figure them out. 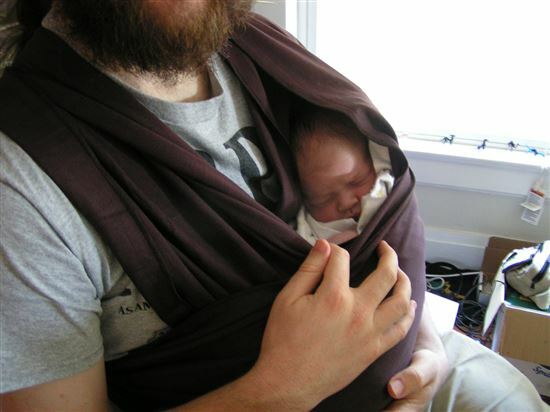 Newborn babies in particular will appreciate the sling-type carriers that keep them cocooned and close to your heart, mimicking life on the inside. Older babies will want a front row seat to the world around them. Options abound in the baby carrier segment, but time-strapped and sleep-deprived parents don’t have the time to sift through all their options. Here at CreditDonkey.com we’ve got you covered. We’ve done the homework to come up with the top three baby carriers to meet everyone’s needs. Comfort is everything. You may be carrying your baby for extended periods of time, especially if the carrier lulls them to sleep. Comfort will mean different things to different people, but at the end of the day the best baby carriers are the ones that distribute the baby’s weight evenly across your body and not squarely on your back. The need for comfort isn’t only reserved for the wearer. Having a carrier that snugly and securely holds your baby is paramount to making the whole baby-wearing experience a good one. One of the biggest drawbacks to baby carriers, especially for new parents, is when it isn’t easy to use. Slings are very versatile but they can be difficult to master. If it takes more time to get the baby into the carrier than it is worth, chances are the carrier will end up in the bottom of a closet. To avoid a meltdown before you leave the house (not just the baby but you too), go with a baby carrier that you can get baby in and out of in a snap. Babies aren’t cheap nor is the gear you will need in the different stages of growth and development. When it comes to a baby carrier, you are going to want one that doesn’t break the bank. Bells and whistles may boost up the price tag for a baby carrier, but the goal is to keep them safe, comfortable and secure and give you some hands-free time. While you may think priciest = highest quality, that is not always the case. Speaking of price, you are also going to want a baby carrier that can grow with your child. There’s nothing worse than dropping $150 on a carrier that only lasts for a couple of months. We rated each of those 4 factors to give you CreditDonkey’s top 3 baby carrier carriers. Available in different fabric choices, the Baby Bjorn has everything you want from a baby carrier plus a decent price tag too. Yes, you will be dropping around $100 for this carrier but you’ll definitely get your money’s worth thanks to its ability to grow with your baby. Offering front and back positions, the Baby Bjorn will take you from newborn to toddler in comfort and ease. What Others Have Said: A Kidspot finalist for 2013, moms applauded the ease of use, light weight fabric and weight distribution as key attributes of this baby carrier. Why We Like It: Simplicity is necessary, whether you are a first-time parent or it’s your second or third time around. The Baby Bjorn has that market cornered. You won’t have to download a video or pore over an instruction manual to figure this carrier out, nor do you have to pay a fortune for it. You aren’t going to get flashy patterns or styles from the Baby Bjorn but you are going to get a happy baby. The Downsides: Some users of this carrier have raised concerns about the free leg and arm design, which mean’s baby’s legs are dangling out of the carrier. While the company says it gives baby more freedom of movement, some moms are concerned that keeping that position for a length of time can harm children’s hip development. Fabric colors and patterns aren’t as eye catching as some of the slings on the market. Who It Works Best For: Anyone who wants to carry their baby but doesn’t have the time or desire to figure out a complex system. The Ergobaby carrier was designed with ergonomics in mind, as is evident with its bucket seat and up to 4 seating positions. 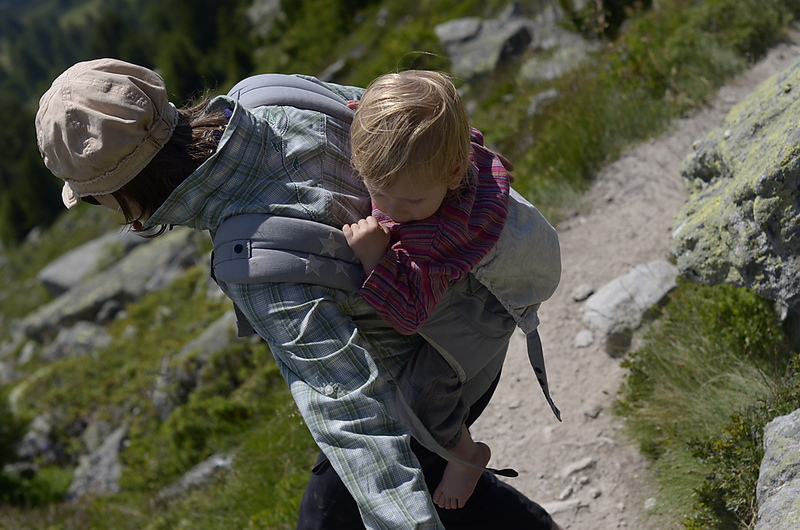 It may not be the easiest carrier to get on, but once you’ve mastered it, you’ll have a happy child, whether you are running errands or hiking a trail. Infants remain safe from the sun’s harmful rays thanks to the sleeping hood, which also provides privacy if you are nursing. What Others Have Said: Garnering 4.5 stars on Amazon.com, reviewers applaud its comfort, and ease in switching positions. Most importantly, it gets two thumbs up from babies. Why We Like It: The bucket seat design of this carrier ensures your baby will always stay in the frog-leg position, which is the recommended seating position. Options abound with the Ergobaby carrier. Price-conscious consumers will want the Original while the adventurous type may opt for the lightweight Performance model. The Ergo also comes in the Designer version for all the fashion-conscious parents out there. The Ergo 360, the newest in the lineup, has 4 seating positions including front-inward, front-outward, hip and back. The Downsides: This baby carrier doesn’t come cheap. The Original is going to set you back about $120, while the Designer model will cost you $160. Some models go for as much as $179.99 online. Who It Works Best For: Anyone who is committed to baby wearing and can afford a pricey carrier. Newborns want to be close to their mother’s heartbeat, and the Moby Wrap does exactly that. Using soft fabric that snugly wraps the baby close to your chest, it’s the ideal way to ease your infant into the outside world. This affordable baby carrier is made of soft, breathable, natural 100% cotton and can be worn in the front or on your hip. Baby’s weight is evenly distributed across your body, giving you tons of comfort when wearing your little one. While the Moby Wrap is affordable, it’s not that easy to wear; newbies will have to view the instructional DVD more than once. Given all the fabric they will have to wrap up into a sling, parents should prepare for a steep learning curve (which may be tough for sleep-deprived parents). But once you master this wrap, chances are you and baby will fall in love with it. What Others Have Said: Baby Maternity Magazine named Moby GO "Top Choice of the Year," with users raving about the soft fabrics, comfort in wearing it, and choices in positions. Why We Like It: When it comes to baby carriers, you can’t beat the price of the Moby Wrap. For under $50, you’ll be able to carry your baby comfortably, securely, and in 100% cotton fabric. Ideal for newborns, we love the fact that you can keep your baby close to your heart. While the original Moby is made for newborns and infants, it does come in other versions for bigger babies and even toddlers. Another great attribute of the Moby: choices in colors and patterns. There’s even a model that uses organic fabric. The Downsides: This wrap has a steep learning curve, which isn’t going to be welcome for any sleep-deprived, short-fuse parents. While the company offers models for bigger babies, those come with a heftier price tag. 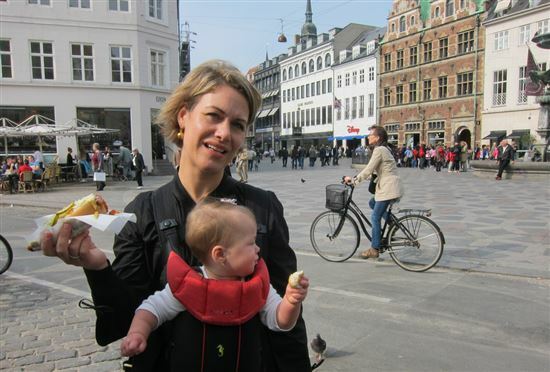 Share on Facebook "Study: Best Baby Carrier - Ergo Baby vs Baby Bjorn vs Moby Wrap"